The whole is greater than the sum of its parts. 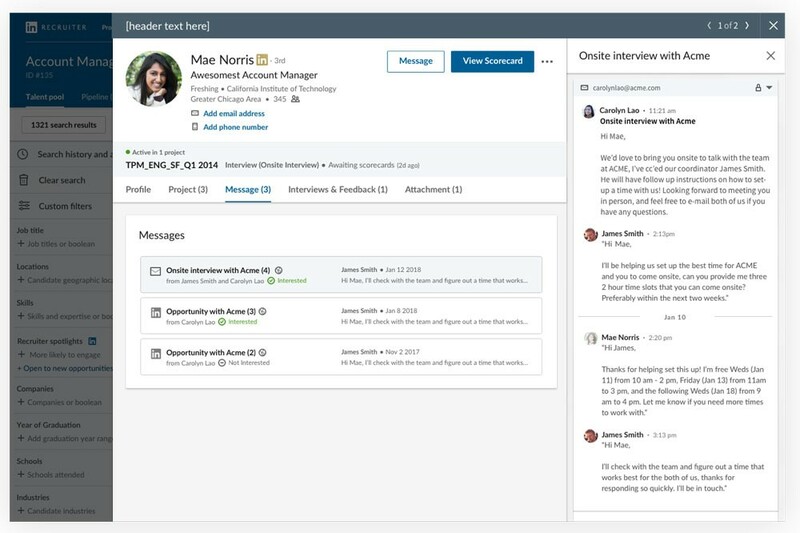 It’s an ancient idea that we’re putting to use with our products: we’re moving LinkedIn’s three core talent tools — Jobs, Recruiter, and Pipeline Builder — onto a single platform, the new intelligent hiring experience, which will make life for recruiters easier, more efficient, and even more aligned with how you want to get things done. While moving these tools onto a single platform, we’re also taking the opportunity to address other customer needs and build some truly exciting new functionalities that will start rolling out midyear. In all, we will be releasing more than 15 new product enhancements for LinkedIn Recruiter and Jobs over the next few quarters. Some of our new features will help recruiters and their teams collaborate better, some will help them to be more productive, and others will provide them with smarter results, but all of them are capabilities we can’t wait to get into your hands. 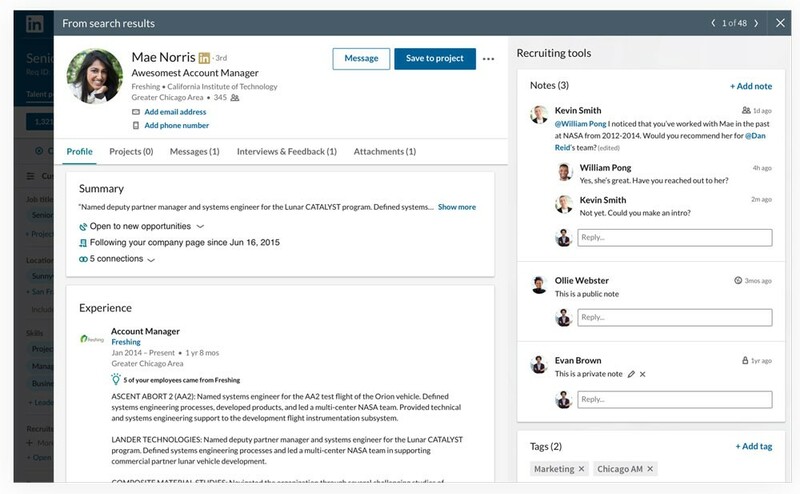 Rolling out this year, recruiters will be able to see all their candidates — whether they’re coming from Recruiter, Jobs, or Pipeline Builder — in one unified pipeline. And now our products will be able to learn from each other, getting smarter with every click and giving you proactive recommendations. Recruiters have told us they’re often frustrated by the need to jump from tool to tool. We’ve heard you. 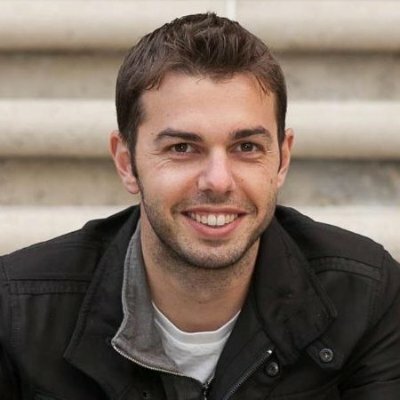 So we’ve put all of our core tools — Jobs, Recruiter, and Pipeline Builder — on a single platform. Once you create a project, you will be able to see the results from all your active sourcing channels — search results, job applicants, media leads — under the Talent Pool tab, and you can manage candidates from there. 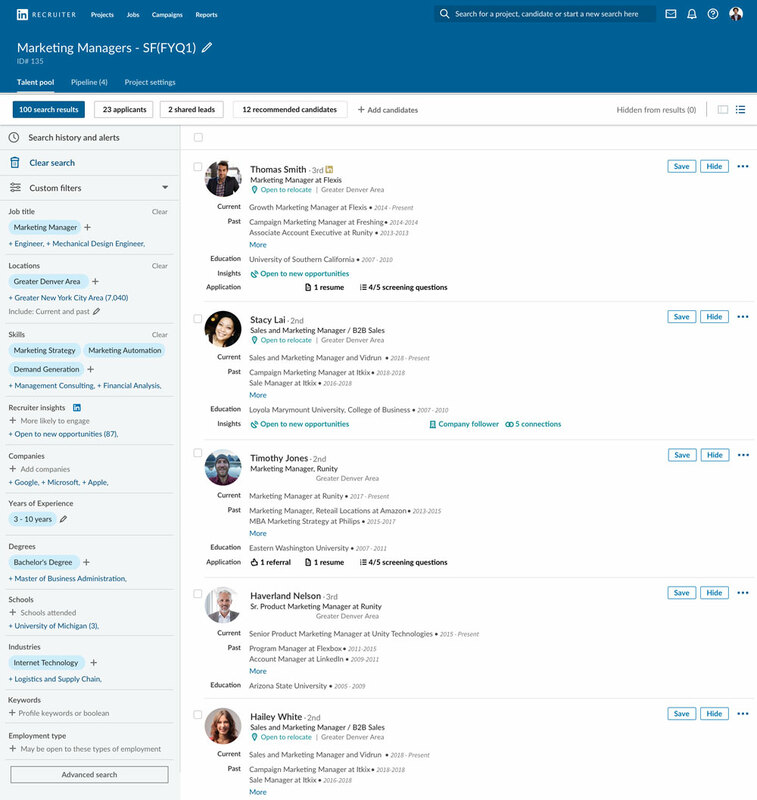 Another new feature, the slide-in profile view, makes it easier to review candidate profiles without having to click back and forth — no more right clicking to open a new tab. The slide-in profile view also allows you to retain your place in your search results. We live in a world of increasingly intelligent products: smart homes have lights, locks, doorbells and window blinds that can all communicate with us. Connectivity is at the heart of this growing shift towards intelligent tools. Much like the intelligent tools you use in your home, our core hiring tools will soon be able to talk to one another and leverage machine learning to simplify the hiring process. Our tools will learn by noting which candidates you save and which you hide as well as which candidates you send InMail messages to. Best of all, the tools will keep getting smarter with every click you make. We’re introducing a new feature that shows the entire communications stream with a candidate in one place. In the example above, Carolyn and James at Acme are both talking to Mae, a candidate for an account manager role. James asks Mae for some time slots during which the Acme team could set up interviews. She gets right back to him with three possibilities. James sends her a follow-up InMail message to let her know he’s checking with the interview team and will get back to her with a time that works for all the people she’ll be speaking with. Everyone on the hiring team can see the entire conversation, letting them collaborate more efficiently and productively. Leaving applicants hanging is bad business. Virgin Media found that poor candidate experiences were costing the company as much as $5 million a year, and one survey showed that over 40% of candidates said that if they don’t hear back from a company they’ll never apply to it again. No response is still a loud message, and it’s not the one you want to be sending. 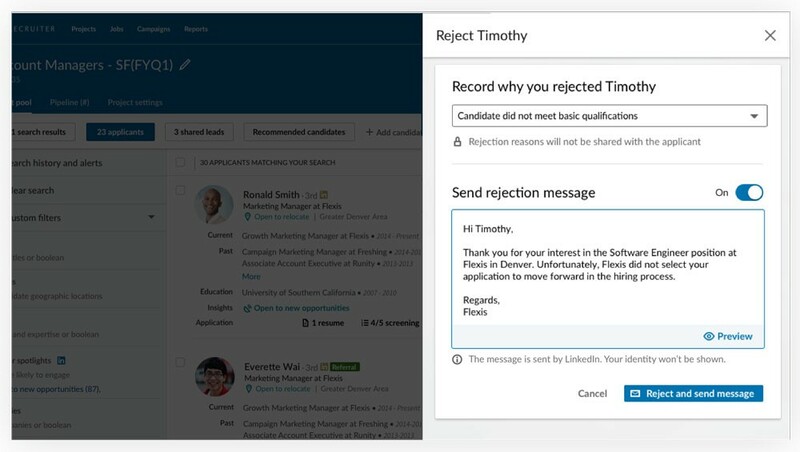 A new feature on Jobs will allow users to send rejection messages to applicants individually or in bulk with just a few clicks. This lets applicants know they are not moving forward in the hiring process. Applicants may not embrace your decision, but they will appreciate knowing the outcome. This will make them much more likely to check in with you the next time they’re looking because they’ll remember they had a good candidate experience. We look forward to sharing more about the suite of enhancements that will be coming your way over the summer and the rest of the year. 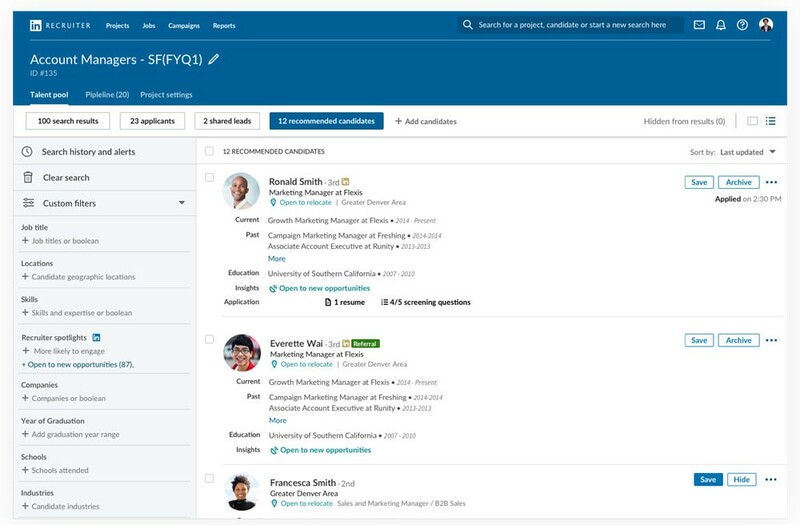 The integration of our core talent tools and other new features will make your job as a recruiter more efficient, and help you get smarter results. And, of course, if you’re interested in learning more, please reach out to your LinkedIn representative. You can also learn more about the intelligent hiring experience here.